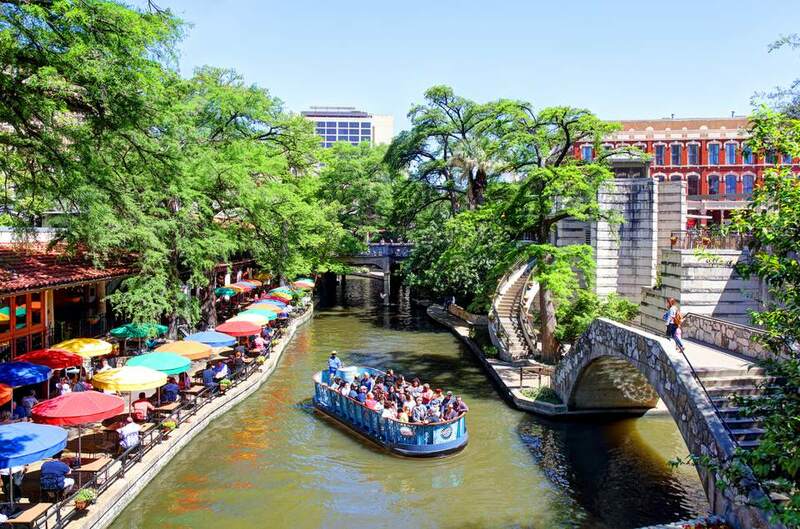 San Antonio is both a sprawling metropolis and a quaint historic village. You'll need to navigate both aspects of this Texas city without destroying your travel budget. Summers tend to be very hot and rather crowded. There are also large crowds around NBA playoff time (the Spurs are perennial playoff contenders) and during the Alamo Bowl football game in late December. In April, the city stages Fiesta (Mardi-Gras San Antonio style). Late fall and spring are excellent choices. Winter, although at times too chilly for a Riverwalk tour, is rarely frigid and frequently a good choice for seeing the city without waiting in long lines. San Antonio International Airport is served by Southwest, which frequently offers very reasonable fares. The airport is located north of the city. Cab rides between the airport and downtown are usually under $40, and up to four people are permitted to share such a ride. San Antonio's mass transit system, called Via, uses streetcars and buses. A one-day pass for unlimited rides is available for $2.75 USD/person. Unless you're coming here for a specific meeting in one place, it's probably a good idea to shop for a car rental. The city serves as an important Texas junction of major routes, with Interstate 10 as the east-west link between Houston and El Paso. Interstate 35 is the north-south link between Dallas/Fort Worth and Austin to the north and southward to the Mexican border. For some visitors, the search for a San Antonio hotel room here is limited to the convention center/Riverwalk area. They often pay a premium to stay in the middle of it all. Be warned: Some hotels that put "Riverwalk" in their names are not within walking distance from that area. Prices are usually lower in the outlying locations. For example, if you have transportation, it's sometimes better to stay on the northwest side, 10 or more miles from downtown, but closer to the airport and attractions such as Sea World and the Fiesta Texas theme park. For a four-star hotel under $150/night try the Sheraton Gunter Hotel San Antonio. Airbnb.com offers rentals in the Riverwalk area and in some other key areas such as Lackland AFB and the Six Flags vicinity. The average nightly rate comes in at just more than $90/night. One of the area's leading camping sites is Admiralty RV Resort, which has a five-star rating and about 240 spaces. Daily rates start at about $50, with discounts available for active-duty military personnel and seniors. The obvious choice of most visitors is Mexican food, and authentic dishes are available throughout the city in many price ranges. Don't just think Mexican here. Good sources for checking out restaurants include the online dining guide of the San Antonio Express-News or see our recommendations below. Riverwalk restaurants can be overpriced, catering to tourists who don't want to venture into the city for more authentic dining experiences. If you're up for some exploring, several good budget choices exist just a short walk from the Alamo and the Convention Center. One example is Schilo's German Deli at 424 East Commerce, where you can order their renowned split-pea soup and a sandwich for about $10. Be prepared to wait in line. More lines and good budget dining can be found at Mi Tierra, a famous Mexican restaurant at Santa Rosa and Commerce. They serve breakfast all day and are open 24 hours. It's a bit of a hike in warm weather from the Riverwalk, so reach for some pocket change and pay for a Trolley ride. You wouldn't go to Paris without searching out the Eiffel Tower, and you can't visit San Antonio without a peek at the Alamo. No matter how busy your schedule, reserve a few minutes to see this historic monument. If you have kids in tow (and even if you don't), it's a good idea to watch the IMAX movie about what happened here before you explore. The movie is shown in the Rivercenter Mall, which is accessible from the Riverwalk and is a short walk from the Alamo. The Alamo is the best-known of San Antonio's missions, but there are many more with colorful histories that you can explore. Typically, there are no admission charges. Six Flags Fiesta Texas is the area's top amusement park. Do yourself a favor and print your tickets for admission prior to leaving for the park. You'll save both time and money. The San Antonio Zoo (3903 North St. Mary's St.) has a strong national reputation, with admission prices under $25/adult but free parking. This is a city where you can skip the expense of a guided sightseeing tour. Some of the best attractions are free, and access is relatively easy. This is the part of Texas that might not fit your preconceptions: Waterfalls, forests, and hills. The area makes a nice one-day getaway, and the prices are often modest for admission to state parks or to the LBJ Ranch near Johnson City, about an hour north of San Antonio. A bumper sticker proclaims "Keep Austin Weird" and it could be a struggle given the numbers of perfectly normal people who are moving here every day. Austin has a well-known film and music scene, and cheap accommodations can be found near the University of Texas campus or at several local hostels.